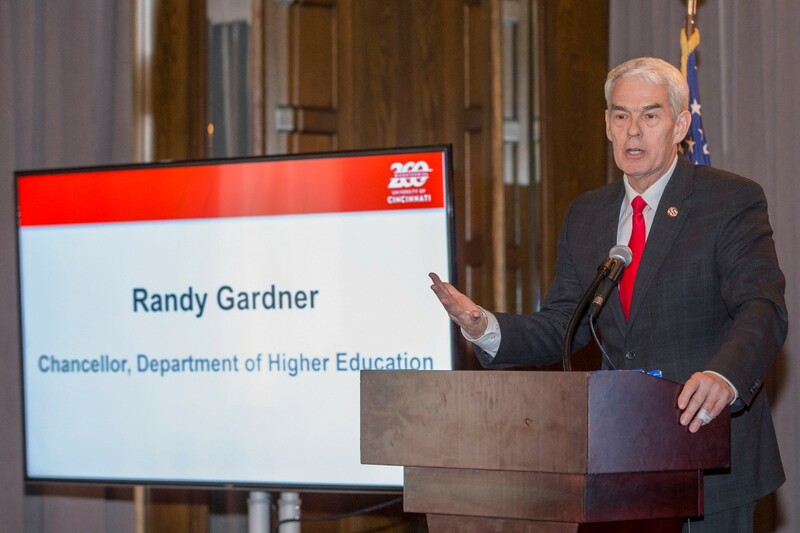 The University of Cincinnati celebrated its Bicentennial where its founding charters began in 1819: the capital of Ohio in Columbus on March 12. President Neville Pinto accepted special commendations marking the university’s 200th birthday from Ohio Department of Higher Education Chancellor Randy Gardner, alumnus and State Senator Cecil Thomas, and alumna and State Representative Brigid Kelly as other state officials and alumni joined in the celebration. 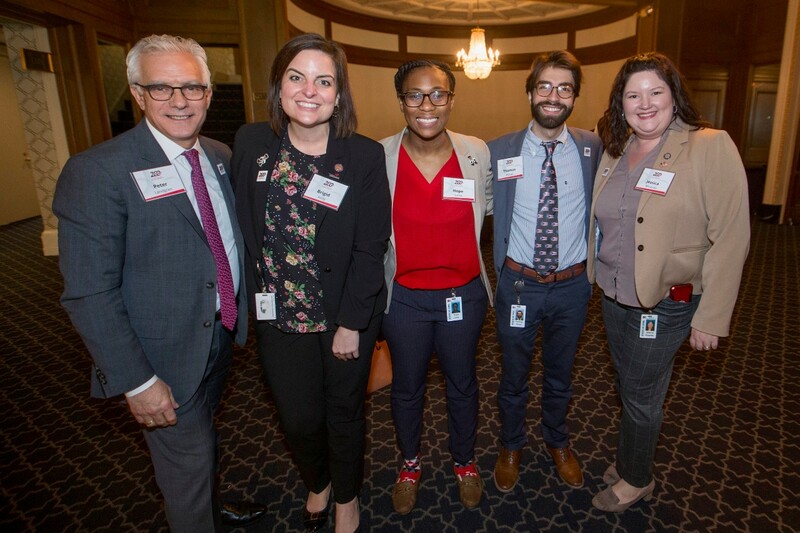 The Columbus event provided a fitting nod to UC’s roots, as it was the state legislature that voted in 1819 to issue two charters to create the Medical College of Ohio and Cincinnati College, forerunners of today’s University of Cincinnati. 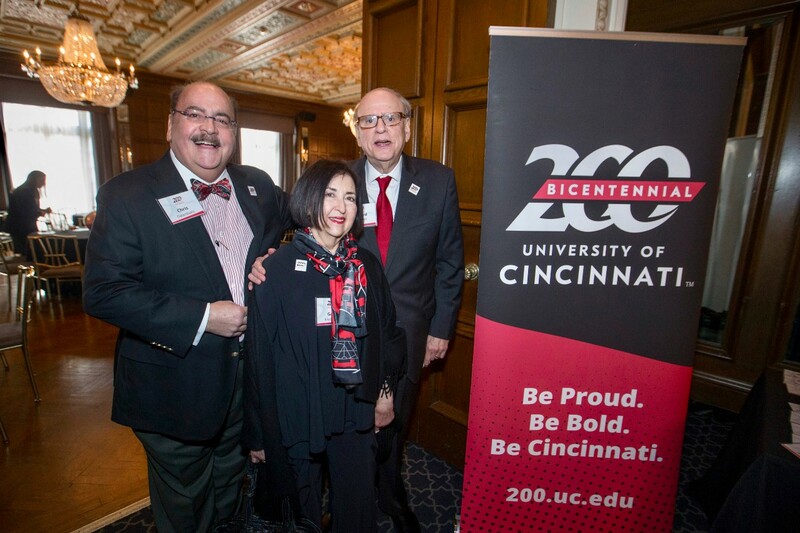 On hand for the event were hundreds of well wishers greeted by President Pinto, Foundation President Peter Landgren and Alumni Association Executive Director Jen Heisey as well as UC Board Chair Wym Portman, and Board members Margaret Valentine and Phil Collins. 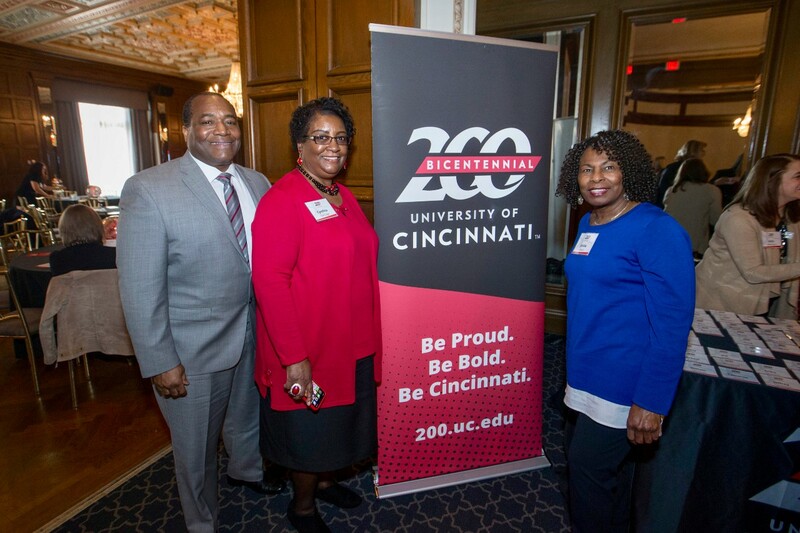 Phil and Lela Collins as well as Kim Dobbs are UC’s Bicentennial co-chairs, and both Phil and Kim also attended the event. 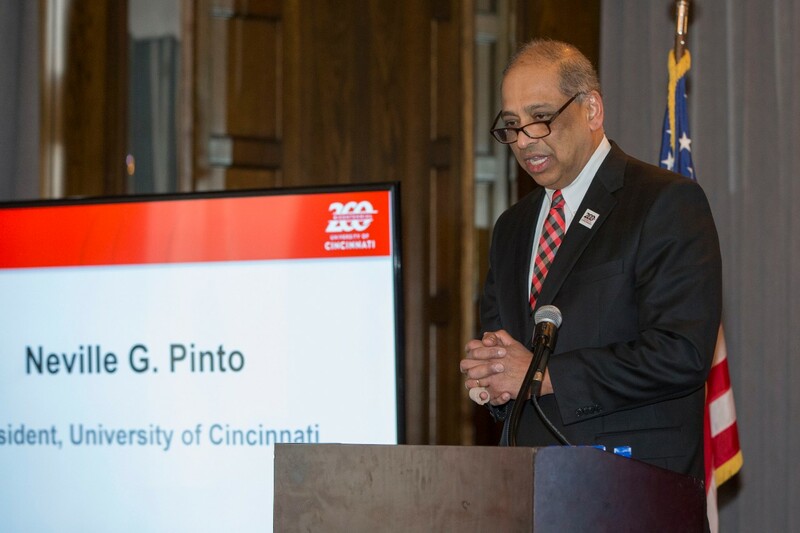 In his remarks, President Pinto recalled UC’s storied past and promising future guided by the university’s strategic direction, Next Lives Here, with its vision of leading urban universities into a new era of innovation and impact. 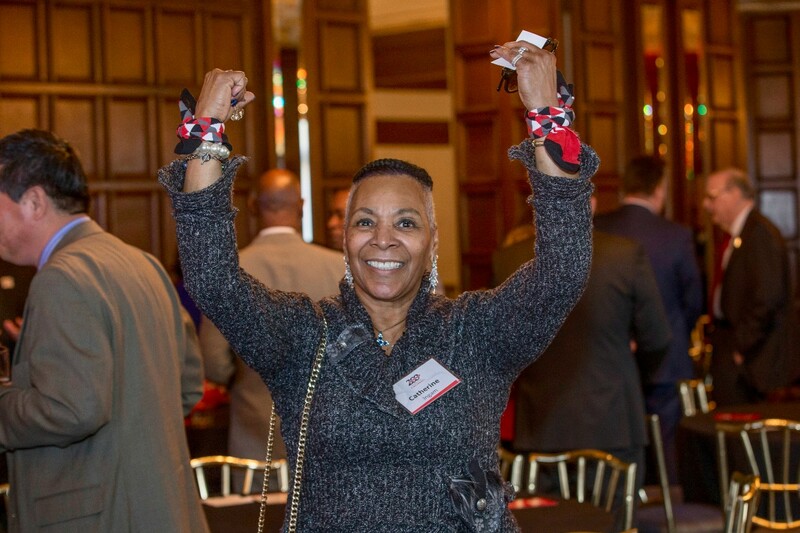 Ohio State Rep. Catherine Ingram gestures "U" for UC. 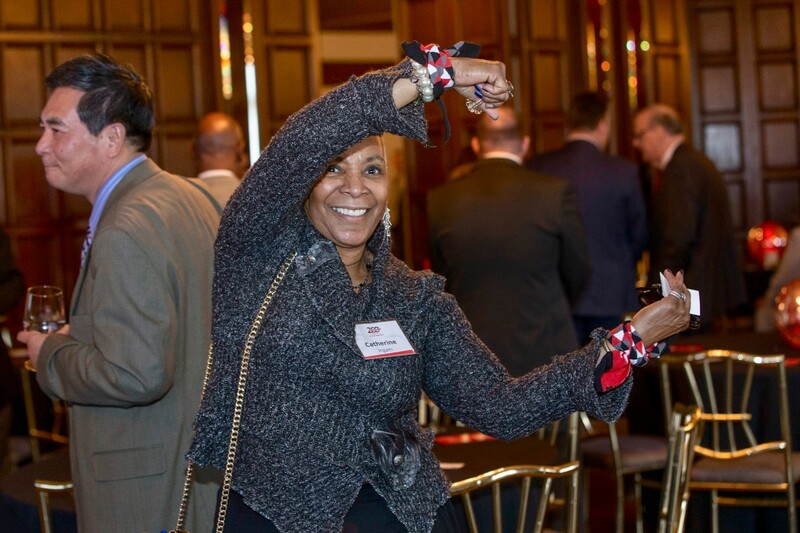 Ohio State Rep. Catherine Ingram gestures "C" for UC. 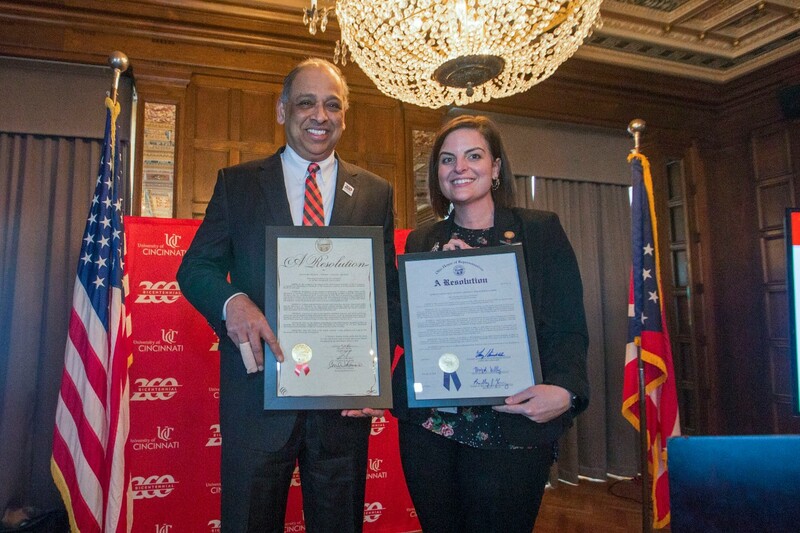 UC President Neville G. Pinto (left) and Ohio State Rep. Brigid Kelly. 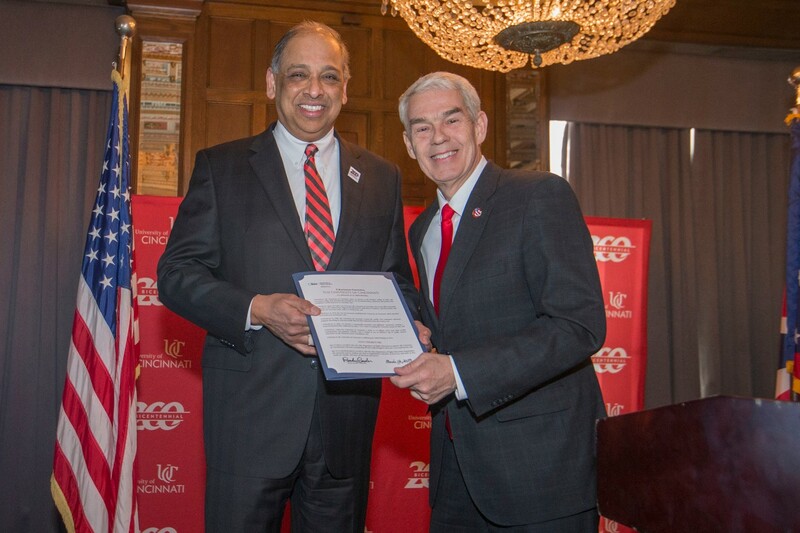 UC President Neville G. Pinto (left) and Chancellor Randy Gardner. 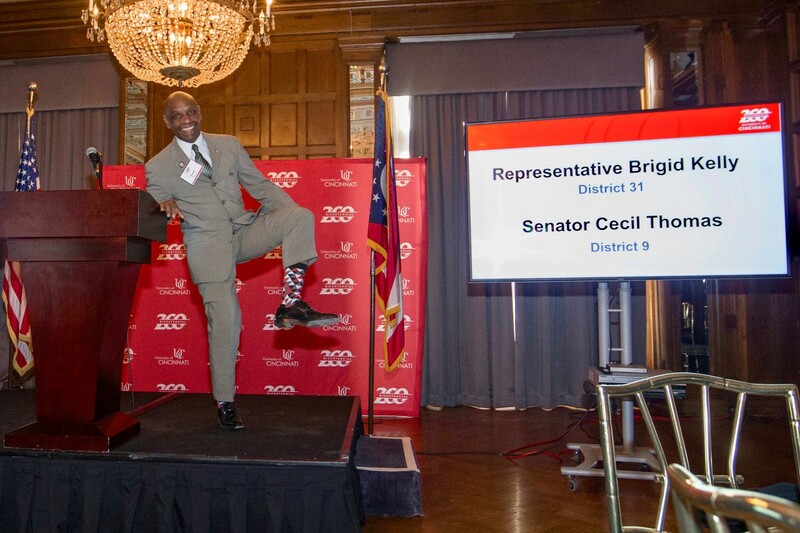 Ohio State Rep. Cecil Thomas shows off his UC socks. 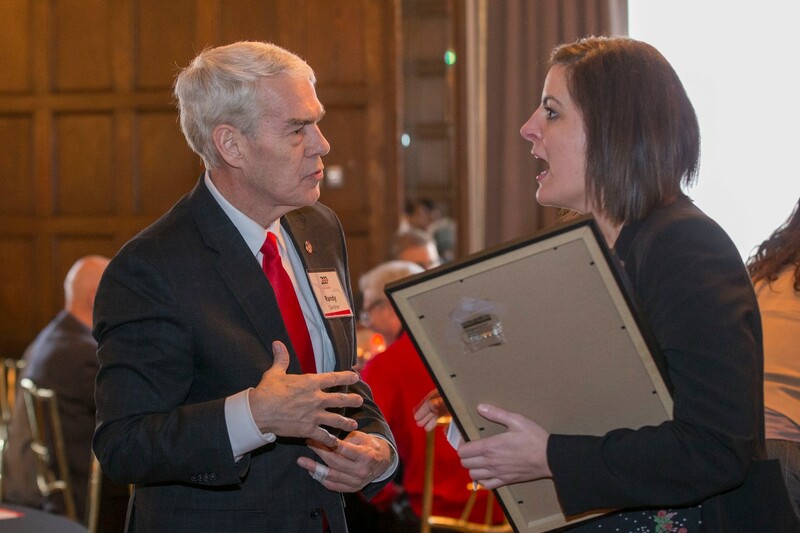 Chancellor Randy Gardner (left) and Ohio State Rep. Brigid Kelly. 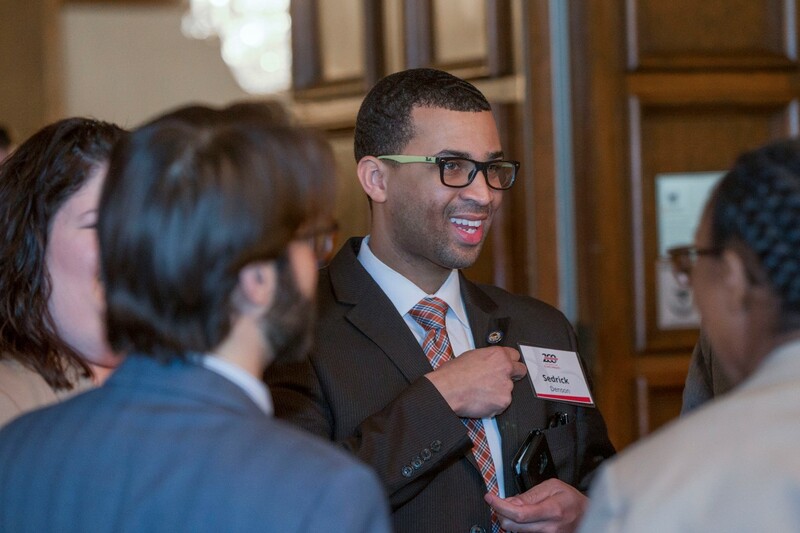 Ohio State Rep. Sedrick Denson. 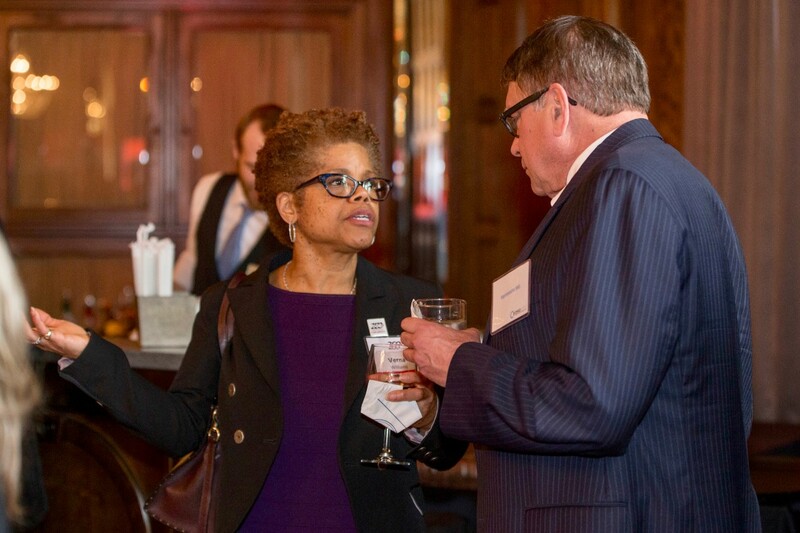 UC Dean Verna Williams (left) spoke with Ohio State Rep. Bill Seitz. 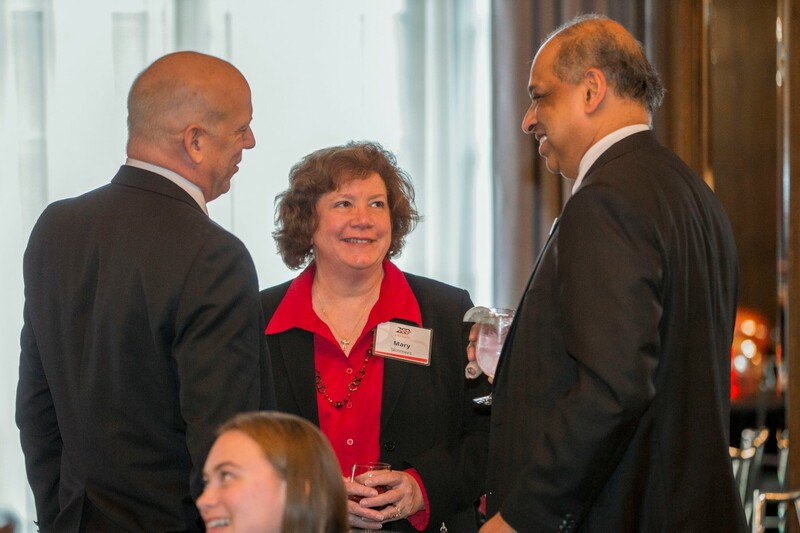 Left to right: Scott and Mary Simmer with UC President Neville G. Pinto. Left to right: Peter Landgren, President of the UC Foundation and V.P. for Advancement, Ohio State Rep. Brigid Kelly, Hope Lane, Thomas Horan and Jessica Miranda. Left to right: Chris Dalambakis, Gail and Richard Friedman. Left to right: Brian and Cynthia Partridge and Jackie Amos. 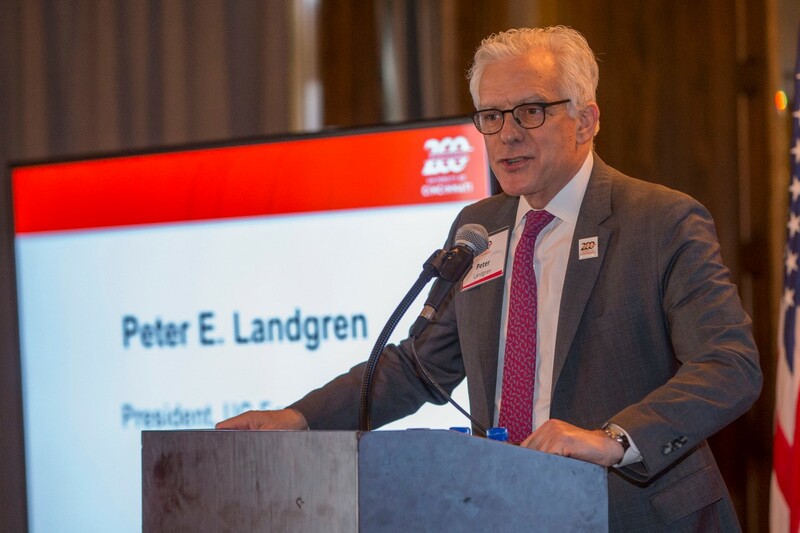 Peter Landgren, President of UC Foundation and V.P. for Advancement.